The Malaysia electricity system is geographically divided into three parts. The greater part of the country’s capacity is located in peninsular Malaysia, where there is an integrated grid system operated by Tenaga Nasional Berhad (TNB). This was a vertically integrated utility until 1997 when its major power stations were transferred to TNB Generation. This remains a wholly-owned subsidiary of TNB, which is controlled by the government. Electricity supply in Sarawak is controlled by the state-owned Sarawak Electricity Supply Corporation (SESCO), while power in neighbouring Sabah is provided by Sabah Electricity Sdn Bhd (SESB). The company was nominally privatized but it now owned by TNB, the Sabah government and the state oil company, PETRONAS. 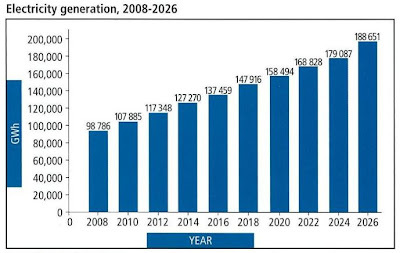 The total installed generating capacity in Malaysia is estimated to have hit 24 187 MW in 2010, up slightly from 24 015 MW in 2009. Peak demand is expected to be 16 332 MW, again slightly higher than 15 943 MW in 2009. This provides a significant margin of capacity over demand. Generation is dominated by fossil fuel-fired power plants. The country ostensibly promotes a five-fuel policy, but in practice gas, coal and hydropower currently dominate generation, while oil and renewable energy make only a small contribution. Natural gas is the basis for 59.1% of generating capacity, coal for 34.0% and hydropower for 6.3%, with oil and renewable amounting to only 0.6%. Installed capacity on Peninsular Malaysia in 2010 was 21 790 MW, of which 42% was controlled by TNB and most of the remainder by independent power providers (IPPs). SESCO’s 1315 MW of installed capacity is primarily based on fossil fuel generation, while SESB has 1048 MW. 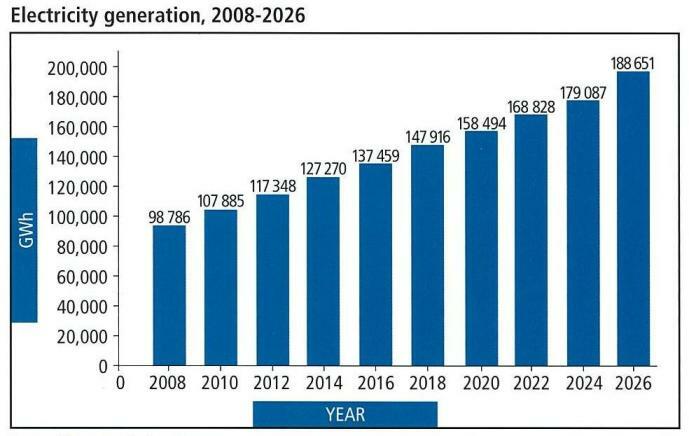 Total production in Malaysia in 2010 was expected to reach 98 786 GWh while consumption was predicted to be at 90 800 GWh, a slight decline from the 92 800 GWh recorded in 2009. Across Peninsular Malaysia, TNB generated 41 146 GWh in the 2009/10 financial year, up from 39 368 GWh in 2008/09. The firm’s share of the total market was 41.9% of a gross generation of around 98 200 GWh. Sabah saw power shortages during 2009 due to rising demand and an aging fleet of generating units, which mean at one stage that its margin dipped to -10%.